Juego 6 puntas XZN 1/2" especial VAG,auto use socket set,socket accessories,automotive tools,Kraft-Biteinsätze 12,5 (1/2), Innenvielzahn,Spécifique Douille,juego de puntas xzn de impacto 6pzs,Komplet kluczy udarowych spline 1/2" 6szt,Set 6 bussole spline maschio ad impatto 1/2"
Applications include M14 for VW LT/Transporter, M18 for Volkswagen Golf, M16 for Volkswagen Sharan. 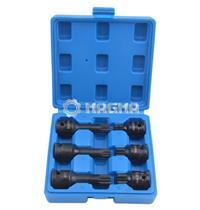 Made of Cr-Mo.1/2" Drive, M14,M16,M18. Chiavi mozzi XZN impact, set 6 pz.